Matt and Mark brace for the Barleywines! Owen Ogletree (director of Brewtopia Events LLC) gathered together Matt Buley (Copper Creek Brewer), Mark Pfeiffer, Lari Cowgill, Geoff Bulpitt (Copper Creek Manager) and Dean Graves on October 15, 2003 at Athens' Copper Creek on Washington Street downtown to sample and comment on several American and English Barleywines. 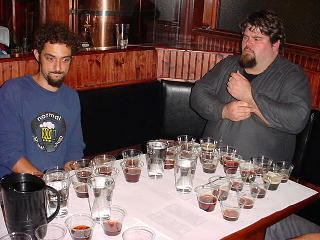 This beer sampling was done as a blind tasting where no one was aware of the brands that were being served. 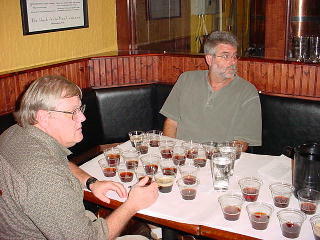 Beers were informally commented upon and ranked according to Beer Judge Certification Program (BJCP) style guidelines. (See the BJCP descriptions below.) First, second, third places, and honorable mention were awarded to the beers we felt represented their individual styles in extraordinary fashion. Because of the excellent quality of each of these beers, it was very difficult to decide on awards (this explains our two honorable mentions). Drop Owen an email to share your comments and opinions. Lari and Dean discuss the style guidelines. Aroma: Moderate to intense fruitiness; presence of hops (English varieties) may range from mild to assertive. A caramel-like aroma is often present. Appearance: Color may range from rich gold to very dark amber or even brown. Often has ruby highlights. May have low head retention. Flavor: Fruity, with a great intensity of malt. Hop bitterness may range from just enough for balance to a firm presence; balance therefore ranges from malty to bitter. Some oxidative flavors may be present, and alcohol should be evident. Mouthfeel: Full-bodied, with a slick, viscous texture. Gentle smooth warmth from alcohol should be present. Overall Impression: The richest and strongest of the English Ales. Aroma: Moderate to intense fruitiness; presence of hops (typical American varieties) may range from moderate to dominant. A caramel-like aroma is often present. Appearance: Color may range from rich gold to very dark amber or even brown. Often has ruby highlights. May have low head retention. Flavor: Fruity, with a great intensity of malt. Hop bitterness may range from just enough for balance to a firm, resiny dominance; balance therefore ranges from slightly malty to intensely bitter. Some oxidative flavors maybe present, and alcohol should be evident. Mouthfeel: Full-bodied, with a slick, viscous texture. Gentle smooth warmth from alcohol should be present. Overall Impression: A well-hopped American interpretation of the richest and strongest of the English ales. Aroma: Caramel, toffee, mild fruit -- very clean, balanced aroma. Appearance: Dark amber with red hints and good carbonation for style. Flavor: Elegant with malty, caramel, fruity, warming notes. This is a tasty beer which hints at currant, pineapple, and plums. Very well-made and extremely well-balanced with a good blend of malts and English-type hops. Aroma: Cascade hops explode in the aroma. There are also floral, caramel, candy and citrus notes that are quite amazing. Appearance: Dark amber with red hints. Flavor: Piney hops dominate the flavor. These hops are powerful and very resin-like with lots of alpha acids. This is a Barleywine that leans heavily toward the bitter end of the style. There is a nice body and caramel malt background, however. A magnificently intense ale. Aroma: Warm aroma that is hoppy with notes of alcohol, caramel, and slightly burnt nuts. Appearance: Nice head and color is very dark amber with ruby hints. Flavor: Peaty with some phenols. Dry for style and a bit astringent with alcohol and hop flavors. Bitter with woody, grassy hops. Tastes a little smoky. Very interesting. Aroma: Raisins, fruit, perfume and honey. Aroma is mildly cellar-like and complex. Appearance: Clear and dark red. Flavor: Winey and slightly tart with hints of vanilla, red clover honey, and caramel. This is very pleasant and drinkable with a good balance of malt and hops. Warming, yet mild for a Barleywine. Aroma: A bit phenolic and musty with hints of wild yeast. Appearance: Too carbonated (maybe from wild yeast) and has a brown, dark amber color. Flavor: Taste is much better than the aroma. There is a carbonation bite that detracts from the flavor -- but fruit, sugar cane and molasses come through. This is slightly sweet and not very hoppy, but the balance is OK. A very pleasant, interesting flavor that improves when the beer warms close to room temperature and loses some carbonation. Aroma: Caramel, raisins, toffee and dark fruit. Flavor: Sweetish and cherry-like. A bit cloying and port-like with a winey, Madeira note. Great fruit hints (figs) and undertones of cotton candy. Aroma: Reminiscent of mincemeat pie, cloves, sour cherry and passion fruit. Smells tart and fruity -- a bit like a Belgian Lambic. This beer could have some spice additions. Flavor: A bit medicinal and thin for style. There are also vegetal hints along with nice flavors of fruitcake and oats. This is a spicy, fruity ale with a somewhat weak finish for this style. Aroma: Alcohol, cellar-like, musty, papery aroma. Flavor: Sweet with hot alcohols. Somewhat cloying -- coats the tongue with a thick/viscous mouthfeel. Flavors of toffee, plum, prune and vanilla. Not very complex. Could use more age. Aroma: Hints of soap, plastic, flowers and perfume. Flavor: A little dry and burnt with a bit of a flat flavor. There is a good medium/full mouthfeel for a Barleywine, but this beer is dryer than most. Flavors are not very three dimensional. Hints of oxidative flavors make this beer taste more like an Old Ale style. Aroma: Burnt rubber, phenols, dark fruit and wood. Flavor: A touch of sourness with some oxidation. Could be infected or mistreated. Not pleasant -- off flavors detract from malt and hop character.